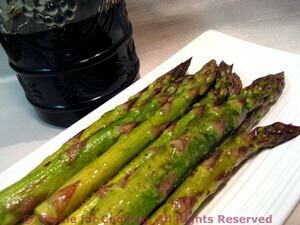 Roasted Asparagus Balsamic, Thyme for Cooking easy spring vegetables. Snap off ends of asparagus. If white use vegetable peeler and peel bottom half of stalk, laying it flat on the counter to prevent breaking. Grill, using a pan, over indirect heat for 8 - 10 minutes, until lightly browned or roast in 400F (200C), oven for 10 - 15 minutes.